And they are so stinking simple to make that well, a third and fourth batch will surely follow. But stay with me here and I promise to get you back to those tiny pieces of toast heaped with goodness…but just a moment for a bit of chit chat between friends. 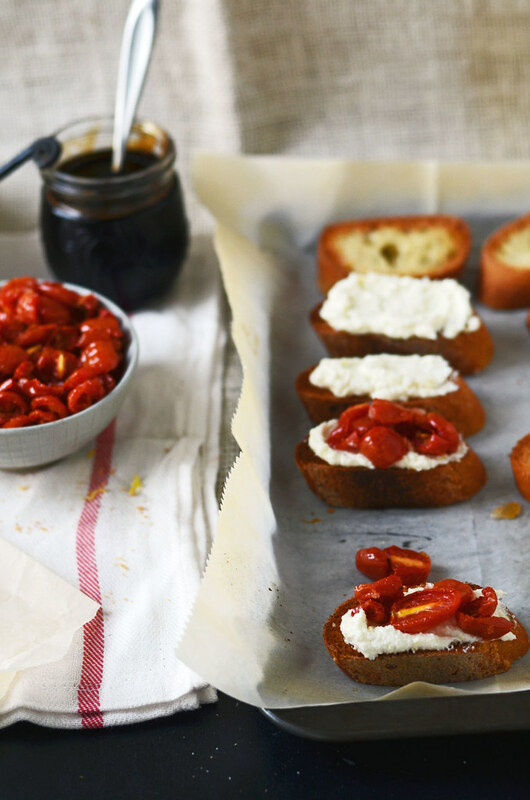 So, I was munching away on these crostini or brushetta or toast with stuff percariously set atop it, when I was reading a past article of Bon Appétit. Side note: I have promised myself that I will read and ‘organize’ and eliminate the magazine mountain that i have not touched in what seems like centuries and continues to grow with each mail delivery… Well, I was working my way through this eye sore in the middle of my dining room table reading a travel issue of Bon Appétit – somewhere between the time of 2012 to 2014 (not joking) and fell upon the discovery of the Faroe Islands. Are you aware of this land mass? I am trying to figure out what is drawing me to this bit of the world and the words that come to mind are vibrant, vastness, treeless, limitless, green, simple, soothing, satisfying. I have done nothing but Google Earth this bit of land all week. Gah! I am obsessed. And seriously, there is a career in this world where one can travel and write and it can all be about food and community and discovery and story telling? (yes, I know, Anthony Bourdain does exactly this as does Francis Lam, the author of the actual article ) Where do I freaking sign up? Sitting on that couch Saturday evening, it just kind of struck me…if I were to take this love for food in any direction beyond this blog, I believe I would find myself somewhere in a kitchen, in a land unknown to myself, listening to stories, cutting vegetables and stirring sauces, and being included in a community by way of the dinner table. It is a lot of information to have been brought to the surface … especially when I had just kind of planned on plopping on the couch for a bit of a rest with a few good articles, a glass of rosé wine, and more than my share of crostini that I had just finished shooting. Sometimes, questions are answered when you aren’t looking. Isn’t that what they say? All I have to say is, this pipe dream seems right. In that, you know when you have hit something on the head, right. Also, something that I know is right ( segues are my thing, no? )…are these piled high appetizers. 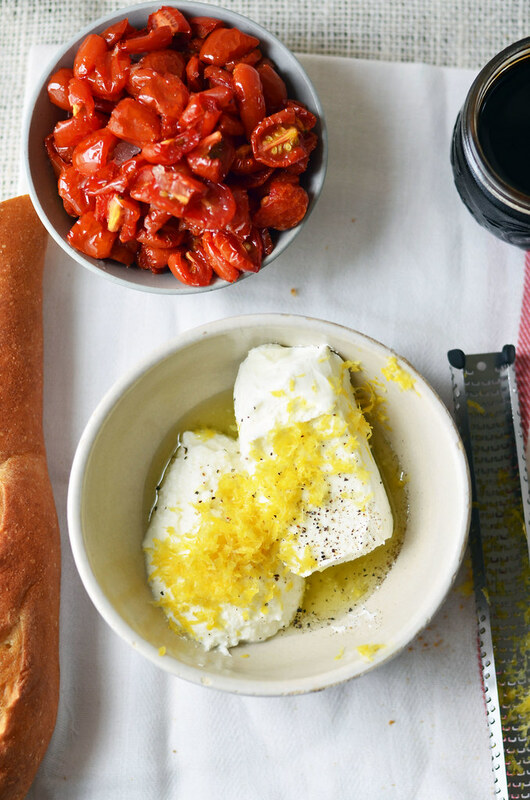 Sharp goat cheese is cut with soft and creamy ricotta and a touch of bright lemon zest. 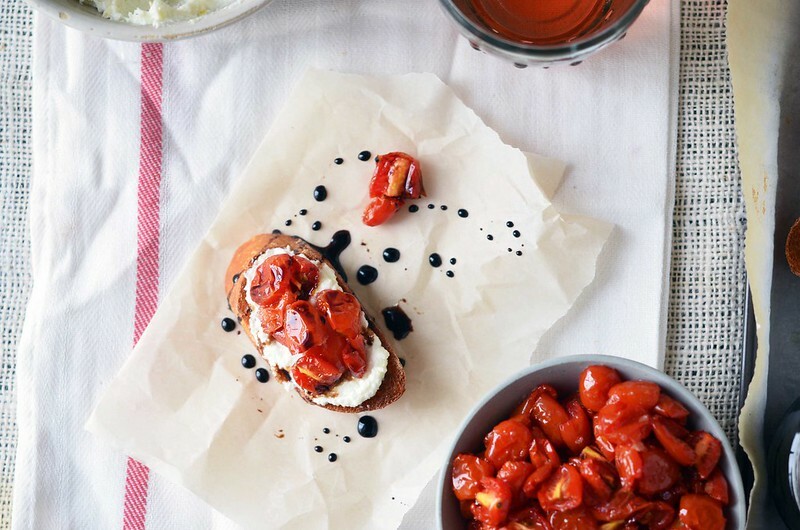 It is then spread upon toasted slices of french bread rubbed with garlic and then piled high with a sweet contrast of sugared candied cherry tomatoes and a drizzle of a tangy sweet balsamic glaze that you will want to pour over everything from fish to ice cream. 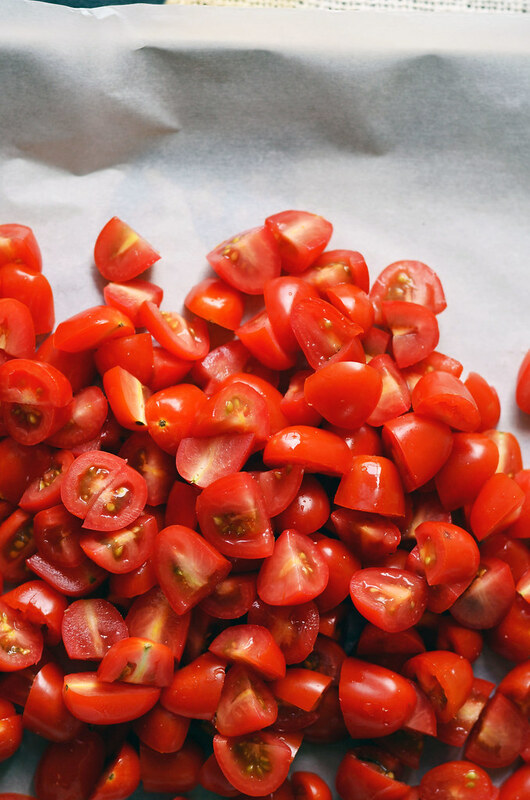 A few batches of these little guys and a several glasses of rosé…who needs dinner? 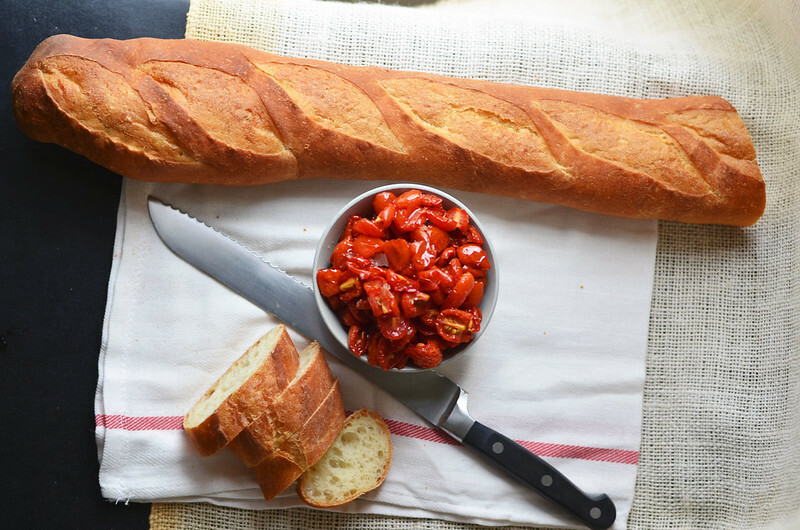 Tomatoes are up to bat, first. You can make these a day or so ahead of time or maybe in the morning to be used in the evening. Just be careful…they have some serious snacking potential. Cut ’em long wise and then in half. I suppose that is called quartering them. 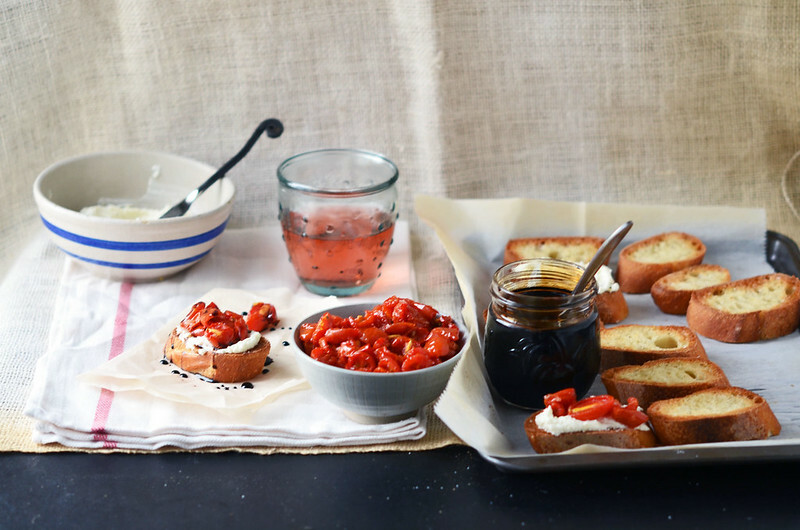 Candied cherry tomatoes. 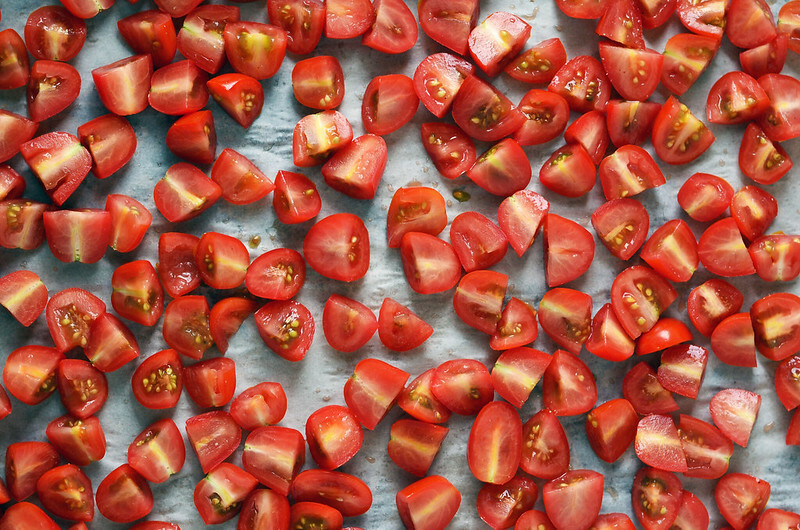 You only need sugar and tomatoes. It is a whole lot of awesome for just 2 ingredients. You will wanna line a baking sheet with parchment paper…no one likes to scrub baked sugar off anything. 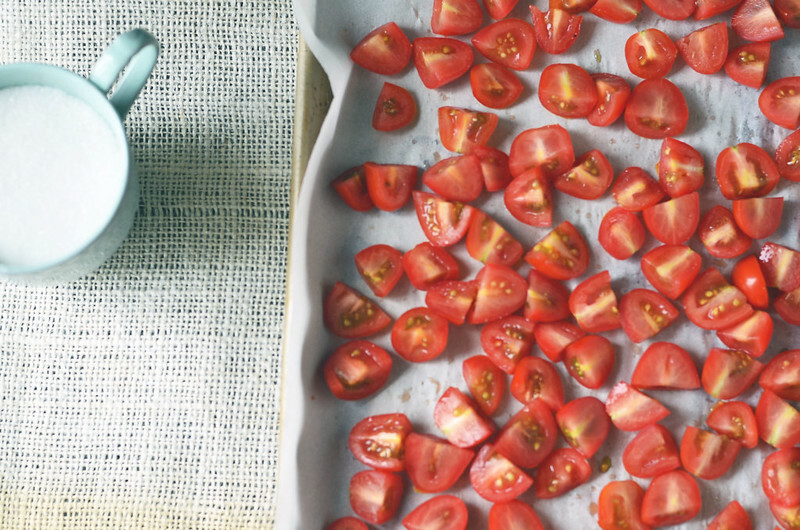 Toss the tomatoes out onto the baking sheet and turn them cut side up. Like so. It will very much so feel like you are turning puzzle pieces right side up. This puzzle ain’t ever going back together. 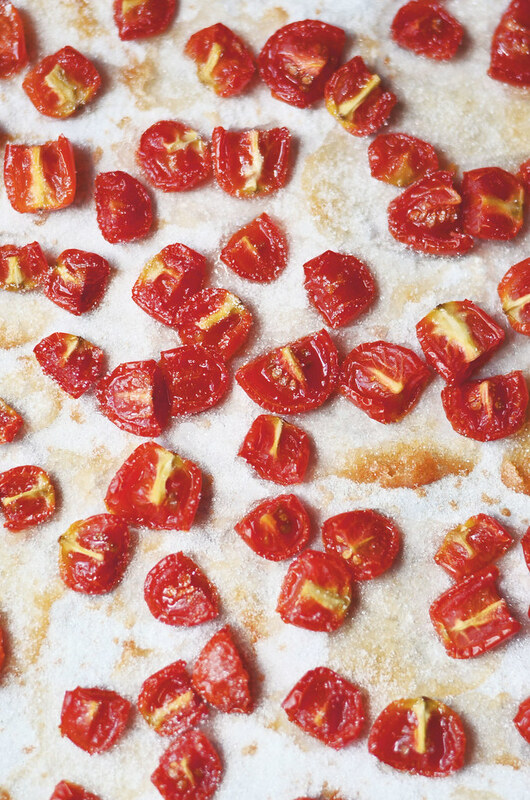 Sprinkle sugar with a heavy hand over the tomato pieces. Don’t skip a one. Cover them all. Generously so. 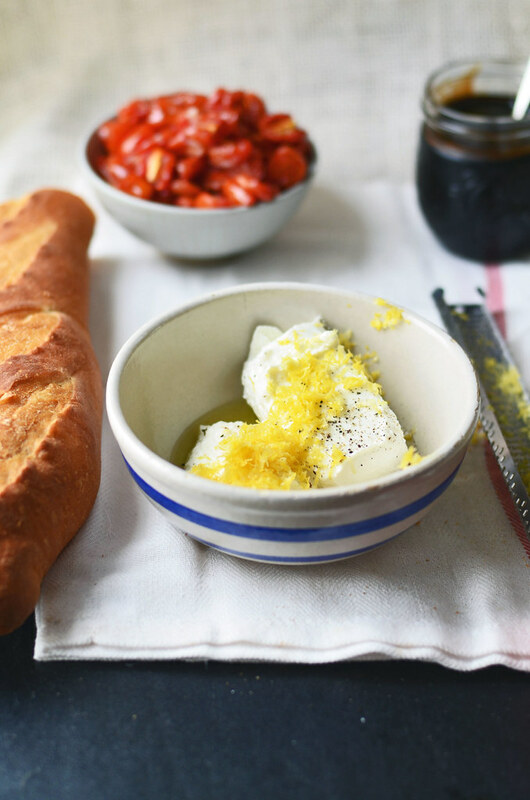 Olive oil and Lemon Zest. I like french bread for this. And well, for everything. I just kinda like french bread. But a sourdough or Italian I would imagine would be equally phenomenal here, too. Slice bread on the bias. Maximize topping area potential. Surface area is at a premium in these parts. 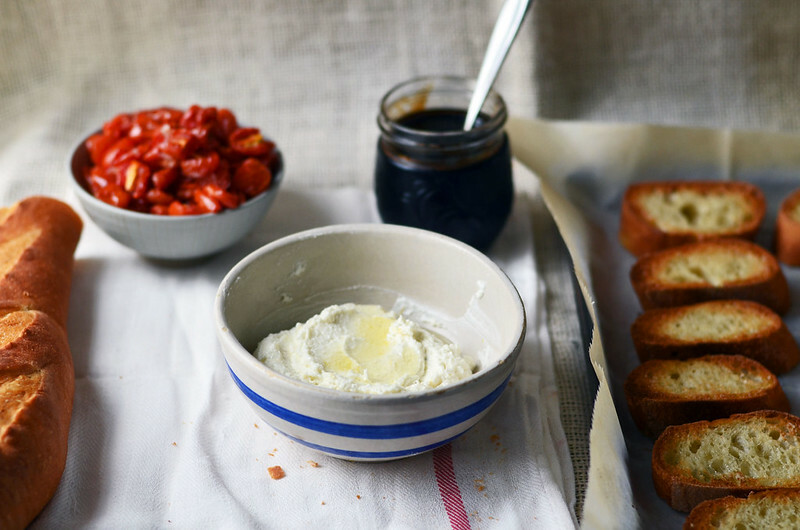 Whipped goat cheese and ricotta. Toasted french baguette slices (can we high five for not catching those suckers on fire under the broiler!). 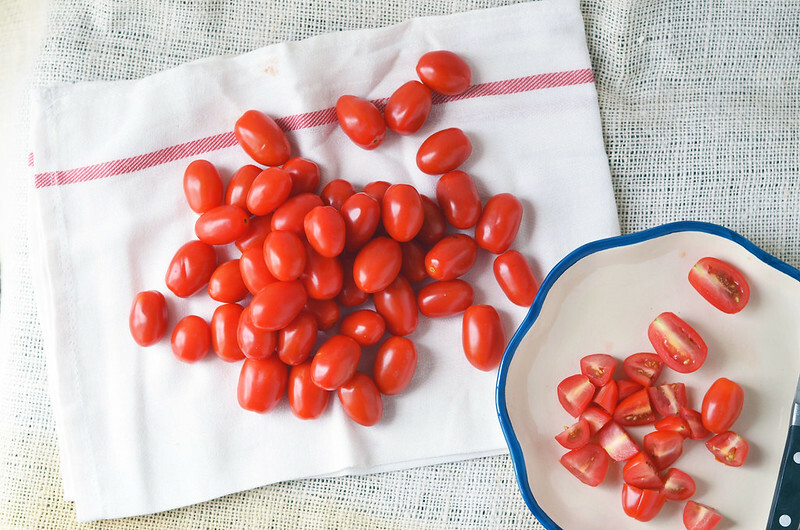 Candied cherry tomatoes. Balsamic glaze. We are are ready to paaarrrrttttyyy! 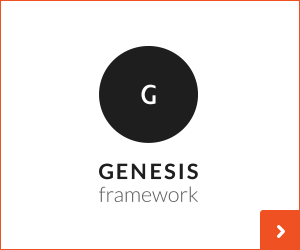 I think it is rather self explanatory on how to build these little guys…but, incase it isn’t. Pour yourself a bit of rosé. I am really getting into rose. Summer is good for rosé. From here on out…it is my summer wine. And there is no shame if you run your finger along the plate, scooping up any leftover glaze … leaving no evidence behind. I am giving you the trick to sneaking seconds and thirds. Pretend you never had a first. Preheat oven to 325F. Line baking sheet with parchment paper, set aside. Quarter each cherry tomato, cutting longwise and then in half, widthwise. Lay them out on prepared baking sheet, cut side up. 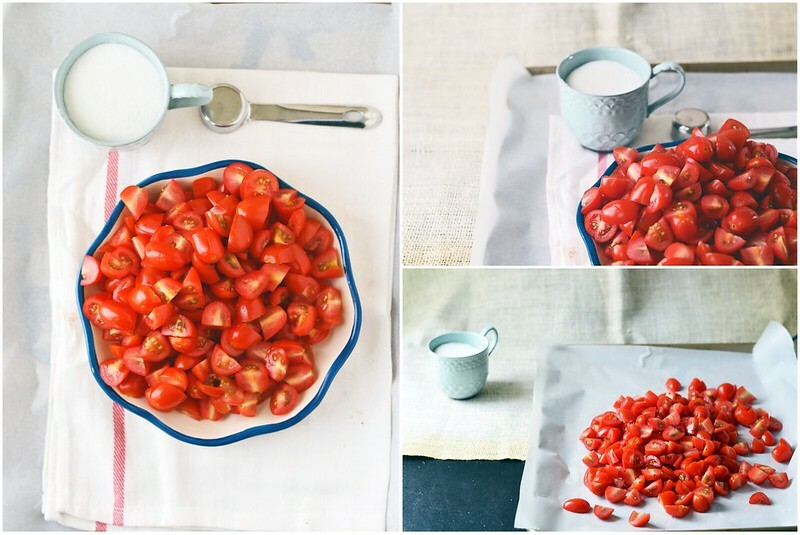 Sprinkle sugar over tomatoes, covering each tomato generously with sugar. Place in preheated oven and roast for 30 to 35 minutes. Remove from oven and let cool and then transfer to bowl. 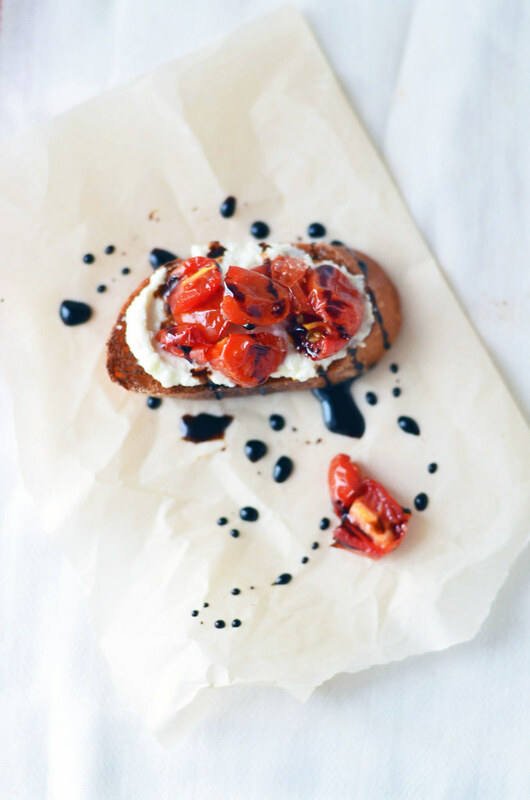 While tomatoes are roasting, make balsamic glaze. In a small saucepan, combine vinegar and brown sugar. Place over medium heat and whisk to dissolve sugar. Bring to a boil and then reduce temperature to maintain a simmer. Simmer until glaze is reduced by half, about 20 minutes. Remove from heat and transfer to a jar with a lid. Prepare spread while tomatoes and glaze are cooling. 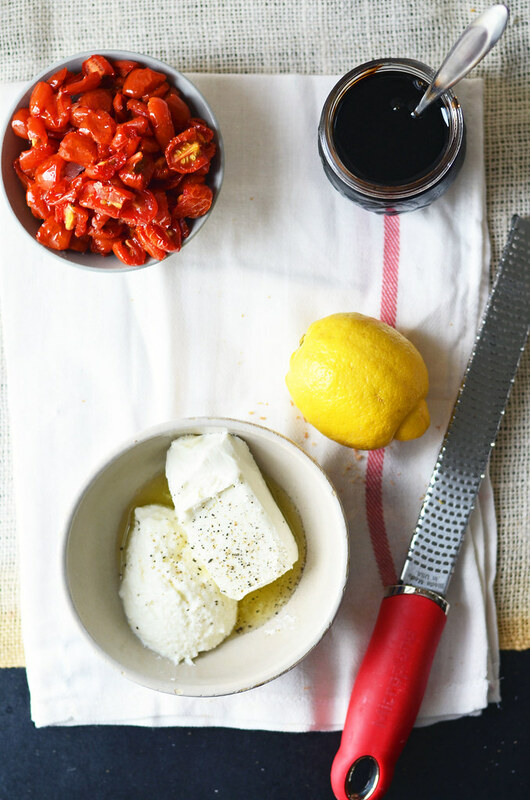 In a medium bowl, combine goat cheese, ricotta, lemon zest, olive oil, and pepper. With a fork or small rubber spatula, stir to combine well. Taste and flavor with salt to taste. Stir. Prepare crostini. Preheat oven broiler on high. 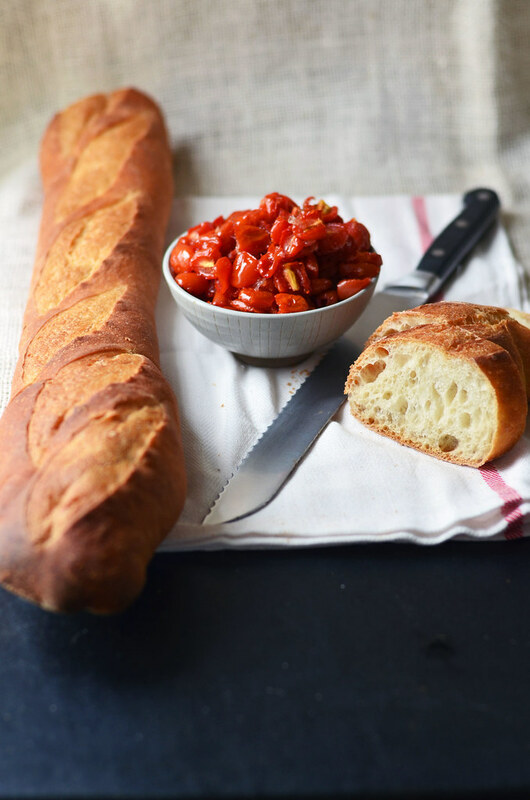 Place sliced baguette on large baking sheet and brush each slice with olive oil. Place bread under broiler and toast until golden brown. Keep very close eye on bread as it can go from golden to burnt in seconds. Once toasted to desired doneness, remove from oven and let cool. Once cool enough to comfortably handle, scrape each slice of toast with a cut piece of garlic. 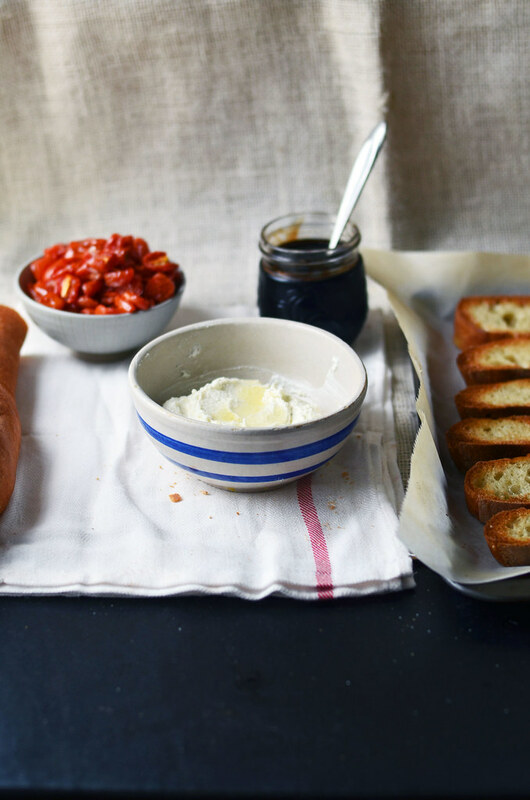 Build crostini by slathering about 2 tablespoonful of goat cheese and ricotta spread onto toasted baguette. 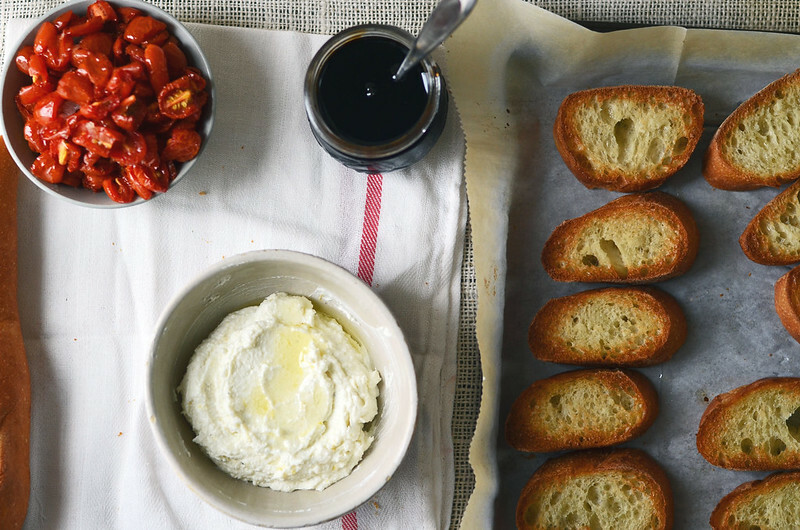 Sprinkle several candied cherry tomatoes atop of cheese spread. 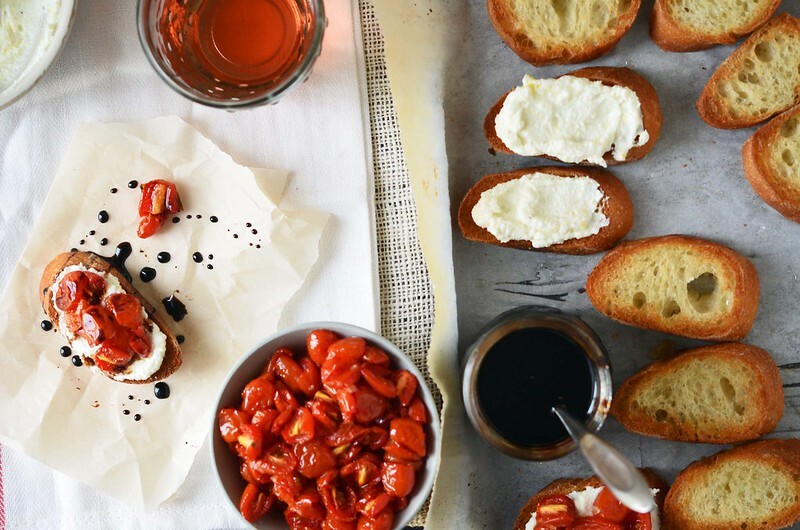 Dip a spoon into balsamic glaze and drizzle glaze over the crostini. 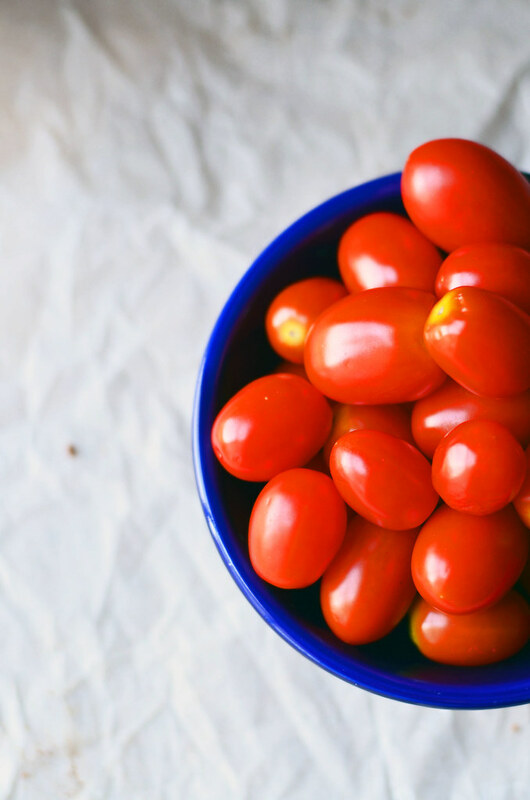 Candied cherry tomatoes can be made a day before and stored in refrigerator. 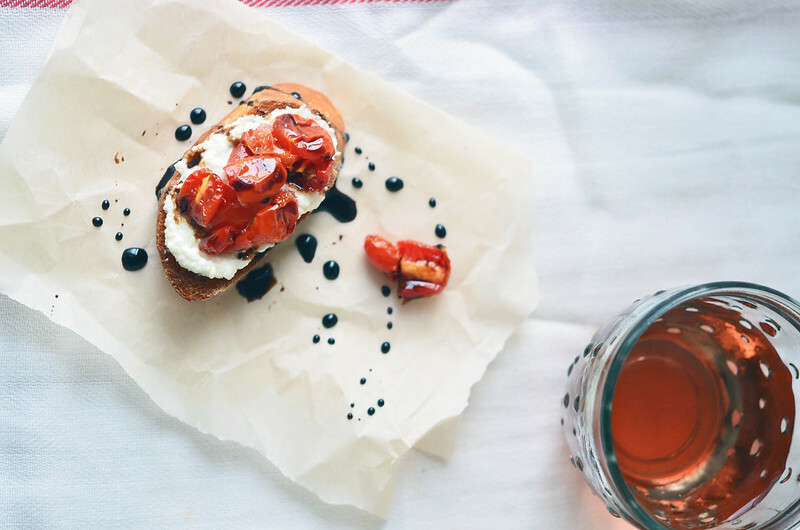 Balsamic glaze can be made days ahead of time and stored in refrigerator until ready to use. Extra glaze is great on seafood to salads to strawberries and ice cream. Glaze can also be purchased...but since you can make it for cheaper, why buy it for more? Unless you are in a total bind and crunched on time, then I totally get it!